May 4, 2015 -- BIT Magazine Laos' capital, Vientiane is a city in constant change. The steady beat of progress in Thailand to the south, China to the north, and Vietnam in the east has steadily fueled progress in the capital itself which serves as a growing hub between the three. 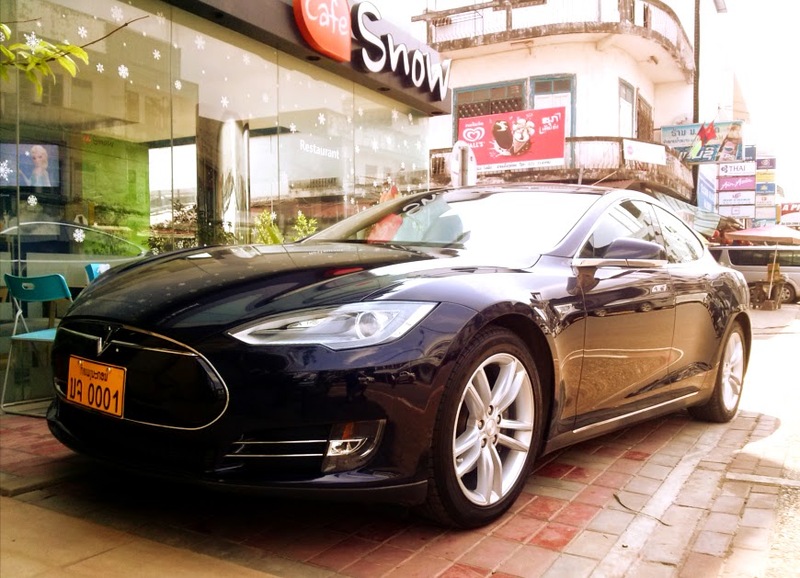 A Tesla Model S in Vientiane, Laos. And just to prove it, one can even find the relatively new (introduced in 2012) all electric Tesla Model S parked outside of Cafe Snow right in the middle of the city. The cafe's owners run a car dealership and acquired the Tesla by buying it from America, having it shipped to Thailand by sea (since Laos is landlocked), and driving it all the way back to Laos. Inside the cafe near the kitchen, you can even see the Telsa's charging station. The Tesla charging station inside Cafe Snow, Vientiane, Laos. 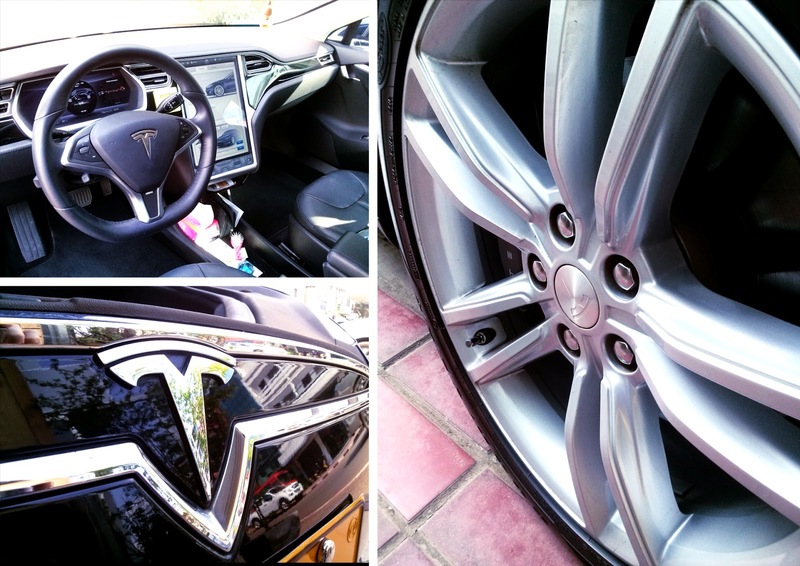 We were lucky enough to get a ride in the Tesla to a local temple for some sightseeing. The car was silent, slick, comfortable like a luxury sedan, and accelerated like a sports car. It has trunk space in the front and back, since the batteries are incorporated into the chassis and the electric motors take up less room than a traditional engine. But more than the features of the car and its performance, or even the fact that it runs off the domestic power grid rather than fossil fuels imported from abroad, it is the curiosity, conversations, and inspiration this Model S creates that we found most impressive. Even as we talked with the owner inside their cafe, people could be seen passing outside, their heads turning even in a city filled with a growing number of Mercedes, BMWs, and even a few supercars. While Tesla cars are still establishing and proving themselves as a viable alternative to traditional combustion engines and even hybrid cars on the market, the promise they hold has everyone who crosses paths with them excited, their interest piqued, and their imagination ignited. 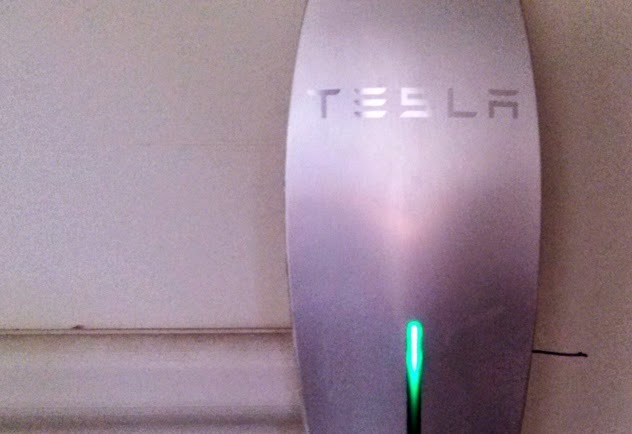 Will others follow in Tesla's footsteps? Will Tesla itself succeed in its vision of replacing combustion engines across the world? Only time will tell. That one of their cars is virtually on the other side of the planet inspiring people is a good start.